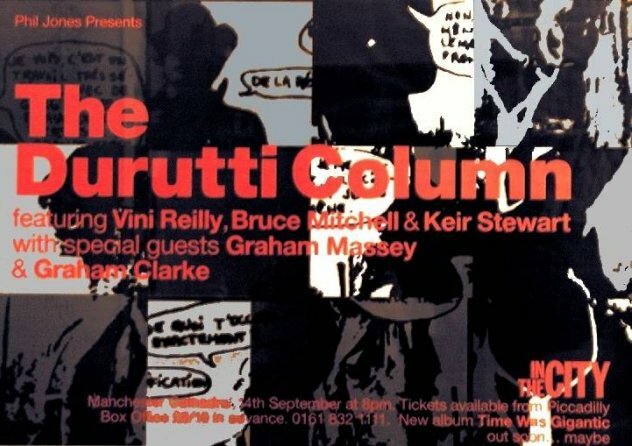 "Phil Jones presents The Durutti Column featuring Vini Reilly, Bruce Mitchell and Keir Stewart with special guests Graham Massey and Graham Clarke"
Poster for gig at Manchester Cathedral on 24 September 1998 featuring artwork by 8vo and the Durutti-inspiring situationist cowboy poster. Note 'New album Time Was Gigantic, out soon... maybe'. Thanks to Andrea Bianco in Italy for the scan.